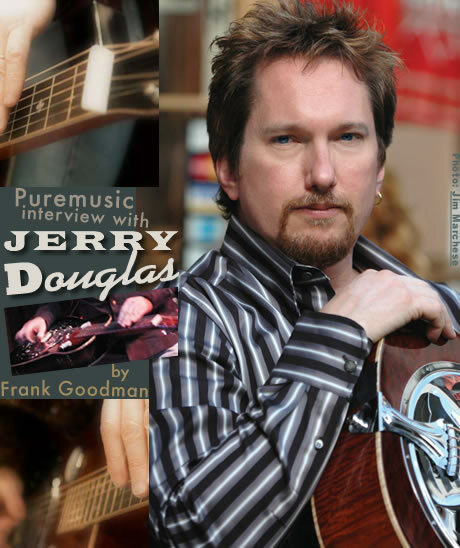 When it comes to newgrass, acoustic music, Bluegrass and Country, if one session man has seen it all, it's got to be Jerry Douglas. James Taylor has Jerry's band open tours for him, and John Fogerty calls him his favorite musician anywhere, anytime. Thousands of recordings and his featured status in what may well be the best live band of any kind on the road, Alison Krauss and Union Station, has made him the closest thing that the dobro has ever had to a household word. We were very impressed to find that Jerry's musical quest is fresh, and that his sense of musical history is a part of him and his music, especially in terms of his instrument, where it came from, and, under his hands at least, where it's going.